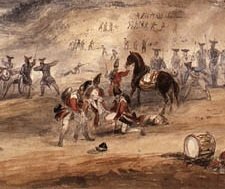 Battle of Saint Foy by George Campion Moses Hazen was severely injured during this battle of the French and Indian War. On this day in history, February 5, 1803, Brigadier General Moses Hazen dies. Hazen was born to a Jewish family in Haverhill, Massachusetts, in 1733. When the French and Indian War broke out, he became a member of the local militia and embarked on a lengthy military career, fighting in numerous actions of the French and Indian War. Hazen was known for his bravery and willingness to participate in the most dangerous missions. He eventually became a lieutenant and retired from the service in 1763. Hazen settled in the Richelieu River valley south of Montreal and went into business with another British officer, Gabriel Christie. They purchased extensive landholdings and Hazen ran the business while Christie was often away. Hazen developed the land, but went into heavy debt to accomplish his schemes and support a lavish lifestyle, building a 20 room mansion for himself. By 1770, Christie was upset with Hazen's liberal spending and sued him. The two were in and out of lawsuits for the next ten years and their property was divided. When the American Revolution began, Hazen was in a quandary. An American invasion was coming into Canada right through his valley. He had to decide which side to favor. 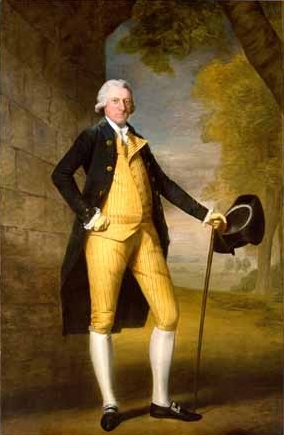 British Governor, Sir Guy Carleton, authorized him to raise a regiment to fight the Americans, but he met with the American General Philip Schuyler instead, and tried to persuade him not to attack Fort Saint Jean, telling him the Fort was well defended and would be difficult to take. Other locals, however, told him the opposite and Hazen was taken prisoner. Shortly after, his captors were captured by the British who then threw him in prison in Montreal for helping the Americans. Hazen was kept in harsh conditions for two months and then captured by the Americans again when he was being transported. After this, he sided with the Americans permanently and joined them in the Siege of Quebec. Hazen was sent to Philadelphia with the news of General Montgomery's death and the failure to capture Quebec. Congress made him a colonel and gave him command of the 2nd Canadian Regiment. Hazen was placed in charge of the captured Montreal for a time and his unit would fight in the battles of Staten Island, Brandywine and Germantown. In 1779, several disputes would erupt and Hazen would be involved in several court-martials and counter charges, but he was exonerated. In June, 1781, Hazen was finally made a Brigadier General and placed under Lafayette in Virginia. His unit was involved throughout the Yorktown engagement and was involved in the pivotal taking of the redoubts around the city. After the war, Hazen settled in upstate New York and continued in land speculation. On paper, he was a wealthy man, but he was continually involved in lawsuits over his debts. In fact, he was arrested 14 times after the war because of his debts. One of his redeeming qualities, however, was that he fought constantly for the rights of Canadian refugees in America who had been forced to leave Quebec after the war. He lobbied Congress continuously for reimbursing them (and himself) for lost property and income. Hazen passed away at Troy, New York on February 5, 1803 and Congress finally awarded a small portion of what he claimed to his estate after his death.